Home Sport Will Brock Lesnar vs Daniel Cormier actually happen? It remains the question on the lips of-of every UFC and WWE fan out there. 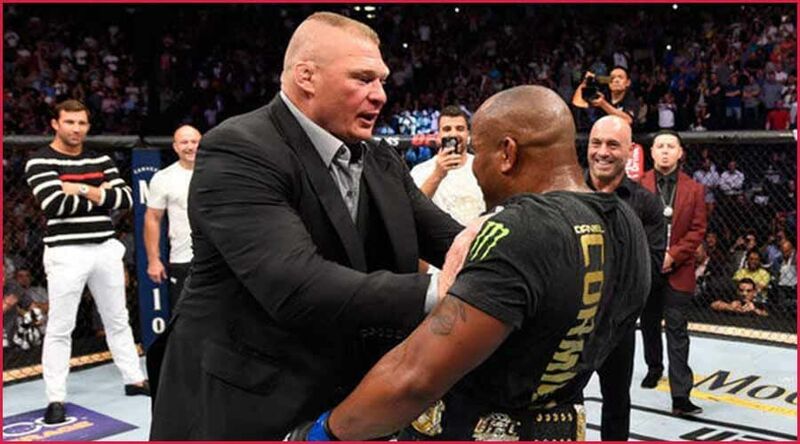 Ever since Daniel Cormier secured the heavyweight title back in July of last year by defeating Stipe Miocic, a potential clash of the titans between Cormier and WWE megastar Brock Lesnar has dominated headlines within MMA news circles. So… is it actually going to happen, and if so when?! With Cormier has long stated that he intends to retire from UFC by the time he reaches his 40th Birthday on March 20th, time is fast running out for this mouthwatering contest to materialise. With that in mind, here is what some of the principal protagonists have said about the prospect of the fight going ahead along with a few factors which may yet prove influential in the course of events. It’s safe to say that the current UFC heavyweight champion is a little unsure what his future holds. He admits that an agreement with his family should see him hang up his gloves when he turns 40 in a couple of months, but recent interviews have done little to confirm whether this will actually be the case. He has been quoted as saying that 2019 is very much up in the air. Whilst Cormier has confirmed that injuries are holding his training back to a certain extent and that he is perhaps not where he would like to be, he remains sure that he could fight again. After all, he has only recently captured the heavyweight title. It can hardly be said that Cormier’s form or fitness is in decline as one might expect in the twilight years of any sports career. White would, undoubtedly, love to see the fight go ahead. Nothing gets the ratings up quite like a crossover matchup… just ask Conor Mcgregor and Floyd Mayweather! Whilst the WWE star has remained fairly tight-lipped when it comes to the prospect of a heavyweight showdown with Cormier, there are a few important factors in relation to his situation, which could yet prove a major sticking point. Lesnar was due to leave the WWE franchise after being defeated by longtime rival Roman Reigns back in August of last year, leaving him free to pursue his UFC ambitions and ultimately a showdown with Cormier. The return of Roman Reigns’ well-documented struggles with Leukemia, however, means Lesnar has accepted a new deal to be Vince McMahon’s flagship singles champion. Whilst the length of this new deal has remained undisclosed, it is definitely for multiple shows and includes a scheduled appearance at Wrestlemania in April 2019. One month after Cormier’s potential self-imposed retirement from UFC. Now, Lesnar’s deal with WWE does not prevent him from taking a fight within the UFC, but whether he is comfortable accepting such a challenge when still under a pro wrestling contract remains to be seen!